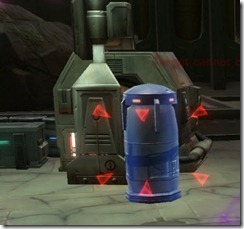 Kaon under Siege is a new flashpoint for level 50s introduced with patch 1.1. It has a distinct “zombie” like theme and does differ from some of the previous flashpoints in terms of overall difficulty (bosses have no enrage it seems). There are 4 bosses in total, one being the bonus boss that drops identical loot to the last boss of the flashpoint (Columi headpiece on hardmode). The bonus boss is quite challenging compared to the rest but the option is there if you want to skip him. What makes Kaon under Siege different from other flashpoints is the difficulty of the trash. The first half of the flashpoint has some champion level trash mobs that have quite a bit of health but nothing too difficult. Once you get to the Rakghoul phase of the flashpoint, trash becomes far more interesting. You need to keep your eyes on the following types of trash mobs. Infected Mercenary: This is a strong level trash mob with the ability Constrict. This is a channeled ability that will stun one of your party members if not interrupted. 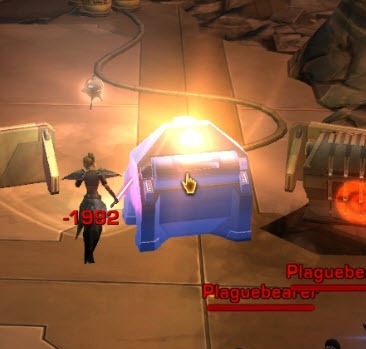 When facing with a pack of mobs, killing and interrupting infected mercenary is the first priority or you will run the risk of having your tank/healer perm-stunned unless they can break out using their stun breaker on a 2 minute cooldown. These mobs can also bug out if you kill them before they are interrupted. They can use constrict on a party member even after they are killed if left uninterrupted. Bloated Plaguebringer: This is guy is easy to spot as he is “fatter” than other trash mobs. He will explode with green goo when he is around 10% health, damaging everyone nearby him in a 5-10 m radius for about 40-50% of their health. He should be killed last and lead away from the group to be stunned in place so he doesn’t run back and explode onto the party. Infected screamer: This trash mob loves to do a pushback on unsuspecting tanks. For this reason, tanks should position themselves with their back to a wall or something so they don’t get pushed back into another pack of mobs. There is no actual boss mob in this encounter but rather it is all about survival against packs of incoming trash mobs. There is a turret that one group member (preferably a melee DPS without a lot of AoE attacks) can hop on and shoot at things (don’t need to click on the mobs to fire, just point and the turret will shoot). Do not hop on the turret right away as doing so will trigger the encounter immediately. There is a pack of trash mobs to the right of the turret that you should clear first. 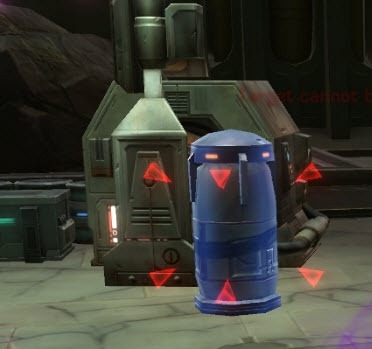 Once that pack of trash is cleared and everyone is prepared, one person hop on the turret while another click on the clickable thingie near the chest to activate a timer. You will get waves of mobs coming at you. At first it is all normal trash that dies pretty easily but pretty soon you will get those “special” trash mobs listed above added to the mix. As long you kill infected mercenary first, position correctly for infected screamer and kill the bloated plaguebringer away from the group, you should not have much issues here. Remember to fight near the turret so you can AoE down the mobs and prevent the party member on the turret from getting knocked off. Whoever has aggro on the bloated plaquebringer should lead him away from the turret to be stunned and finished off. The entire fight lasts for about 3 minutes. He may look big and scary but this fight is actually pretty easy if you have the mechanics down. If you look around, you will see 4 of these clickable things around the room. They are located at each corner. Clicking on this barrel will cause it to explode and damage any mobs nearby, including the boss. The basic mechanic of this fight is having the tank kite the boss around the room and when the boss is near one of those clickable barrels, have another party member click it. This barrel will explode and damage the absorption shield the boss has on himself, allowing you to do significant damage against him. Tank should not get too far away from the boss as the boss will leap to the tank if he/she gets too far away. Beware that the boss can also throw the tank back. These barrels will respawn after being used thus allowing you to come back to it after you have used up the 3 other barrels. Tank should just kite the boss around in circular path, pathing the boss near each of the 4 clickable barrels. Healer could run ahead to get in position to click the barrels while the two DPS follow the boss along, damaging him along the way. As long the tank is continuously moving, he won’t take much damage from the boss and won’t need much heals. The couple seconds after the boss is damaged by the exploding barrel is when you should maximize your DPS. The boss will enter frenzy mode a couple times past 50% hp. Just try not to get hit by the boss. The bonus boss can be spawned by destroying clickable consoles you find throughout the flashpoint. Before you can get to the bonus boss, you will have to get past a room filled with trash mobs that can be a deathtrap for unprepared groups. What I recommend here is hug the right wall and move through the room this way, keeping your back against the wall as there are quite a few infected screamers that can knock you into a nearby group of trash mobs. You can jump up the ledge as need to move forward. The bonus boss is actually the toughest mob in the entire flashpoint and its certainly in the same level as some of the tougher bosses in other flashpoints such as Commander Jorland in BP HM or Krel Thak in Ilum HM. Once again, having a melee DPS heavy group would be disadvantageous for this fight but luckily there is a way around it. Explosive shot: Missile attack with splash damage, spread out. 15 second cooldown. Directed at random party member. Barrage: Channeled missile attack directed at one person for high damage over a short period of time. Cooldown its 60 seconds. Grapple: This is an AoE grapple that will pull all party members to him unless they are blocked by some obstruction. Party members should run out after being grappled in as there is an AOE proximity attack coming up. Used about every 30 seconds. Energy Shield + Adds: At precisely 66% and 33%, KR-82 will channel this energy shield on himself for 20 seconds. During these 20 seconds KR-82 will not attack the party. Immediately after he starts the channeling, he will spawn 3 strong probe adds called Emergency response droids that needs to be controlled or killed off. The hard part about this boss is the three probe adds that spawn at 66% and 33%. These droids hit very hard and if left uncontrolled they can absolutely destroy the party. These droids spawn exactly where KR-82 stands before you engage him, this means that if you pull KR-82 away from his original spot, these adds will take quite sometime to get to you, giving you more time to manage them (arrow in the picture below points to where the probe adds spawn). 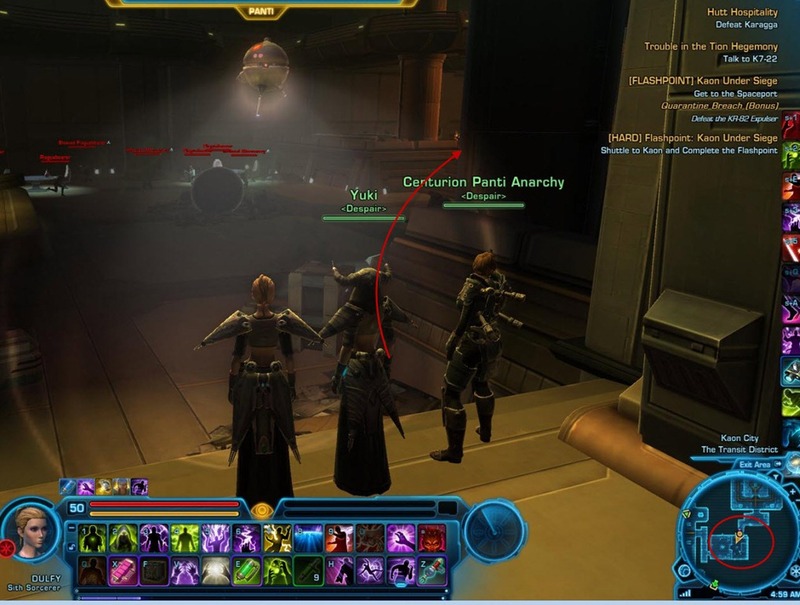 Crowd control (CC) abilities works great here if you have two party members that can CC two out of the three probes. 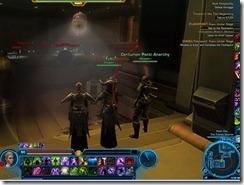 The remaining uncontrolled probe can be killed off while KR-82 is in his energy shield phase. You should finish off the two controlled droids as well before the next wave of droids spawn at 33%. For the wave of adds at 33%, you can kill off one droid, CC the the rest and then just focus on the boss rather than wasting time killing off the two remaining droids. If none of your party members have a CC ability, you can try to have the adds kited around or have someone with in combat run speed pull the boss far far away (he doesn’t enrage in hardmode) such that the probe droids will take forever to get to the boss. This allows your party member to simply burn the boss as you can still attack him even when KR-82 has the energy shield up. Other than the adds, this fight is pretty straightforward but can be a healer check due to all the random damage your party members will receive. This fight is super duper easy for the last boss of this flashpoint. This encounter comes with 3 bosses, Commander Lk’garaagth (main boss with ranged attack), Chak’aghakh (melee goonie), G’klarg (rakghoul monster thingie that can pin a party member down). Both Chak’aghakh and G’klarg have a buff called Under Orders and will attack whoever the Commander tells them to. Shortly after engaging this encounter, you will see an emote text: Commander Lk’graagth has ordered his squad to attack Player X. This is a cue that the two goonies will chase down one person to attack. The good thing is that these two do not hit very hard and can be tanked by pretty much anybody. Tanks should be able to taunt these two goonies off after. DPS should focus on one of the two goonies and burn one down. After you kill one of them, there will be a wave of plaquebringer adds that come through the door. A few AoE abilities will finish them off quick and the tank can use AoE taunt to gather them up. 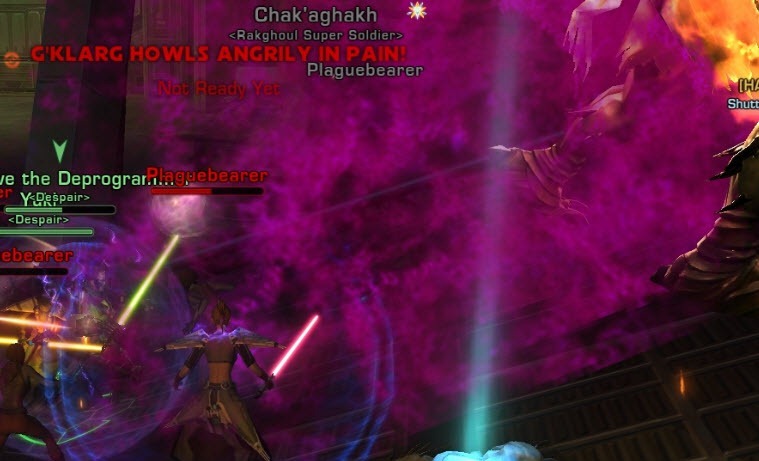 If you get G’klarg down past 50%, he will howl in pain – marked by the trail of purplish mist behind him. This will increase his damage output so make sure to finish off any plaquebringer adds before this point and healers pay attention to the health bars. Killing off the 2nd goony will spawn another wave of plaquebringer adds – then it is time to finish off the Commander. room before the bonus boss: we just pull the 2 sets into the small room beforehand, and AOE them down without having to worry about knockback, makes the room go by really fast. on the bonus boss, we tried the kiting method, and found it to be laborious. The easier method for us, the boss is tanked exactly where he stands. -at 66%, we back up toward the hut in the center of the room, to allow some room for the CC to happen, instead of standing under them. We CC 2, kill one. the tank goes back to the boss. the 2 dps then kills the 2 remaining CC’s one at a time, focusing on stuns while dps’ing to minimize damage (this fight isn’t about speed). -at 33%, we repeat, except instead of the dps killing off the remaining 2, we just keep them CC’d until the fight’s over. we found the above method to be a lot more predictable, and easier to execute. Is that a typo for “plaguebringer” or do these rakghouls come and make your teeth dirty? Today on HM we hat some difficulty with the last boss while trying to dps down G’klarg first, because the Commander’s shots hurt quite some, and likely our tank didn’t keep his aggro. Finally we concentrated on the Commander first, who went down rather quickly. Whoever had the goonies chasing after him, kited them around some, ’till we killed them off. Bonus boss: Kite him to the behemoth spawn and kill him there. No enrage timer means you can just dps him down without any issue. Anyone done the bonus boss since they changes in 1.2? I believe they rooted the boss in place so you can’t kite him away (I don’t know personally because I’ve never tried moving him). 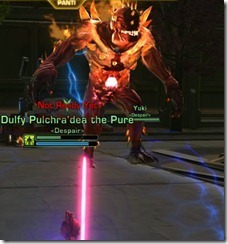 He does seem to have an enrage as well now, but it doesn’t hit too hard. 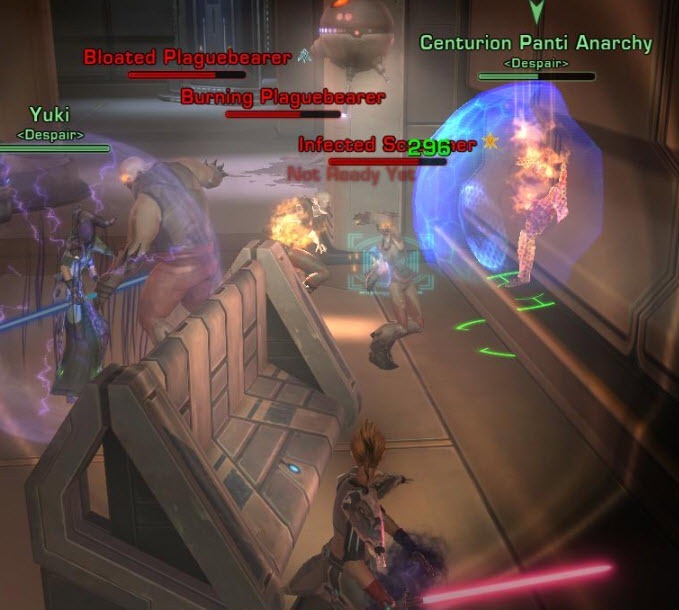 If you don’t have at least two in-combat CCs in your party I don’t know if it’d even be possible to beat him given how hard those droids hit.How my group does it now is simply stack on the boss for AoE heals. First add wave tank AOE taunts (so a squishy doesn’t get unlucky aggro) and we CC two droids and burn them down one at the time, second wave we CC all three and ignore them while burning the boss. 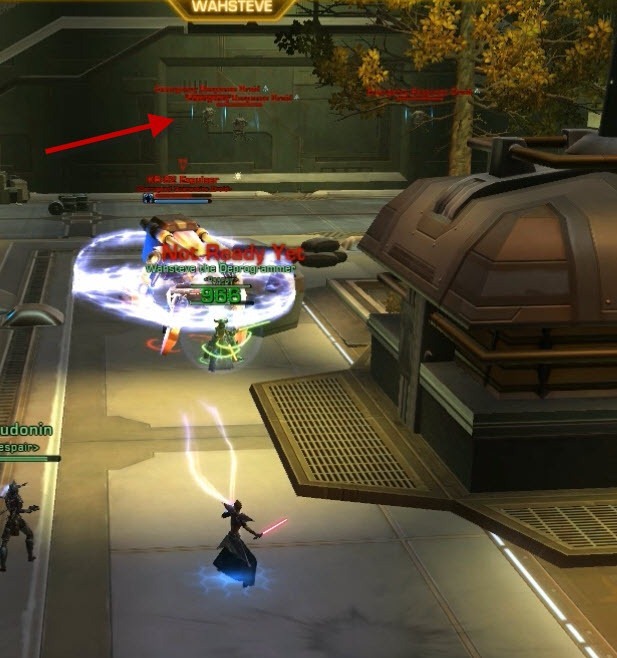 One small thing that’s made it easier is the added ability to bind target markers to keys, so we can quickly mark + CC a droid for coordination. Works great if u have some R-DPS as they can fight will standing on those pipes on the back wall. This guide is really outdated. The bonus boss cannot be moved around anymore and he enrages now. You can still CC the droids but you need to bring good dps for the bonus or altogether skip it.